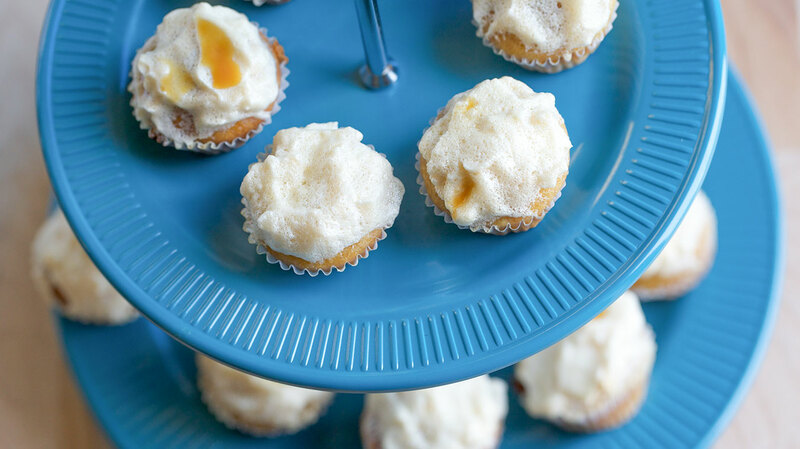 Mini cupcakes are the perfect treat for a party! Preheat the oven to 350°F. Line a 12-cup muffin pan or a 24-cup mini muffin pan with paper liners, spray the liners with cooking spray, and set aside. Whisk the flour, baking soda, baking powder, salt, and sugar together in a medium bowl until combined. In the bowl of a stand mixer fitted with the paddle attachment, beat the vegetable oil, Caramel Syrup, Madagascar Bourbon Vanilla, eggs, buttermilk, and espresso on low until blended. Mix in flour mixture, ⅓ at a time, until the batter is smooth. Divide the batter evenly amongst the prepared pan. Bake the cupcakes for 20-25 minutes and the mini cupcakes for 15-18 minutes, or until a toothpick inserted in center comes out clean. Cool completely on wire racks before topping. In a large bowl using a handheld mixer, whip the egg whites to stiff peaks. Drizzle French Vanilla Agave Nectar slowly into the egg whites, whisking continuously until blended. Top the cooled cupcakes, giving them the appearance of a cup of coffee with froth on top. Drizzle with Crema di Caramel Syrup to replicate the appearance of a caramel macchiato from your local coffee house.